As a teacher specializing in restorative yoga, and a student of Judith Hanson Lasater’s, I adore sandbags. Just set me up with my legs up the wall, put sandbags on my feet and head, and I’m as content as a kid in a blanket fort. Even better: Let me set you up so I can enjoy the look of happiness on your face when the pose really reaches out and embraces you. One of my favorite things about sandbags is their versatility. They can help activate the relaxation response that occurs when the parasympathetic nervous system calms down. They can also help ground us, stabilize hypermobile joints, and increase awareness of our breath’s complex relationship with the body and mind. One of my favorite things about sandbags is their versatility. Once you have your sandbags, you can put them to work for you in the following asanas. 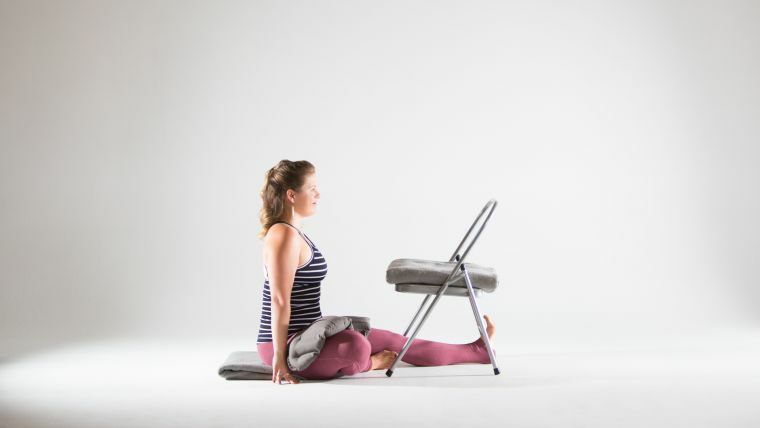 While it may be possible for you to achieve these poses unassisted, restorative-like practices can also be an ideal opportunity for partner yoga. Try doing these asanas with a friend, switching roles as giver and receiver as you feel inclined. You Will Need: A sandbag, a long yoga strap, a helper. Here are three examples of using sandbags to increase awareness and stability in mountain pose (tadasana). 1. Stand with your feet hip-width apart and parallel. Stack your shoulders over your hips and your hips over your ankles. Feel the weight in your feet. Notice whether you tend to carry more weight in the front, back, or sides of your feet, then aim to distribute it as equally as possible. Feel your spine lengthening as you envision the crown of your head rising toward the ceiling. Now ask your helper to place a sandbag over the tops of your feet. Make sure its weight is evenly distributed. How does this affect the sensations in your spine and head? Do you feel lighter when your feet are so well grounded? 2. Take the sandbag off your feet. Re-establish tadasana. Ask your helper to place their hand lightly on the crown of your head, and press the crown of your head into their hand. Imagine a tiny airbag between the base of your skull and the top vertebra of your neck. Inflate that bag. Feel your skull lift. Now ask your helper to place a sandbag on the crown of your head. (Caution: If you have issues with your cervical spine, check with your doctor before bearing any extra weight on your head.) If it slips, place a washcloth between the sandbag and your head to provide some grip. Inflate your tiny airbag and press the crown of your head into the sandbag. Feel the small muscles on the sides of your neck and around your ears engaging. Practice walking with your sandbag on your head. Then remove the sandbag and lift your elegant, regal head into an imaginary weight. 3. Make a long loop with your yoga strap, preferably an eight-foot one. Slip it over your chest and under your armpits and let the bulk of the strap hang down your back. Then take the part of the strap that’s across your chest and slip it over your head so that it rests on your shoulders like the straps of a backpack. Position the buckle near or just below your buttocks. Ask your helper to place a sandbag on the bottom of the strap so that its weight releases the muscles at the base of your neck. Feel the effect all the way down your spine. Lift your skull. Stay for several breaths. Next, try lengthening the strap so that the sandbag hangs farther down. How does changing its position affect your experience? You Will Need: One to three sandbags, a folding chair, one to three blankets, a washcloth or small towel, a helper. In seated forward bends, sandbags can help ground your legs and extend your spine. I was also taught by Iyengar teachers that sandbags can even create tiny movements in the joints of your skull which may help to relieve headaches. This is one of my personal favorites. 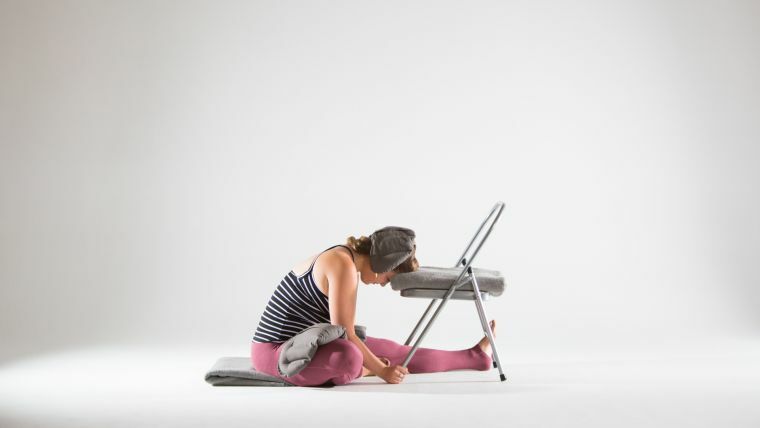 Place a folding chair on your mat and sit facing its seat, far enough away so that when you fold at your hip crease, your forehead will rest on the edge of the chair seat. Extend your left leg. Bend your right knee and bring your right foot to the inside of your left thigh. For this version, your hips should remain square to the front. If you are quite comfortable sitting unsupported on the floor, that’s fine. Personally, I prefer to sit on a folded blanket for this one. Flex your left foot and make sure the center of your heel is on the floor. Point your left kneecap up at the ceiling. Use your hands to rotate the flesh and muscles of your left thigh inward. Now place a sandbag on your left thigh, at about the center of your quad; keeping your knee facing the ceiling, use the sandbag’s weight to draw your inner thigh toward the floor. If your right knee is way off the floor, you can place a rolled blanket under your thigh right near the hip joint. Now you can place a sandbag on your right thigh—not on your knee—about halfway between your hip crease and knee. Place this sandbag so that it encourages an outward rotation of the right thigh. You might think that the sandbag and the blanket support would cancel each other out, but they don’t, because if the blanket is near your hip, it will leave most of your thigh free. Make sure there is no pressure on the knee joint itself. Now fold forward from your hips, keeping your spine long. Bring your forehead to the chair. You may want to place a blanket on the chair seat for warmth and softness. As someone with lots of pitta and kapha in my constitution, I enjoy the sensation of the cool, smooth, firm surface of the naked chair seat, especially on a hot day, but you may prefer padding. Hold on to the chair in a way that’s comfortable for you. You can hold the sides of the chair above the seat, hold the legs of the chair, or rest your arms on the chair. The important thing is that your spine is long and your shoulders relaxed. Have your helper place the sandbag on your head, across and just above the base of your skull (it shouldn’t touch the crown of your head). Use the washcloth or towel to prevent slippage if your hair is very smooth. If the sandbag absolutely will not stay, you can place it the long way, but try not to cover the crown of your head. (You can rest the end of the sandbag on a block to help prevent this.) The intention behind this setup is that the weight of the sandbag on your skull, plus the weight of your skull on the chair will cooperate to open, very slightly, the sutures of your skull. As you stay here and breathe, for five to fifteen minutes, try to sense the subtle opening of the bones in the back of your skull and the crown of your head. Have you ever seen steam coming out the top of a cartoon character’s head? Imagine that this is happening to you in this pose. 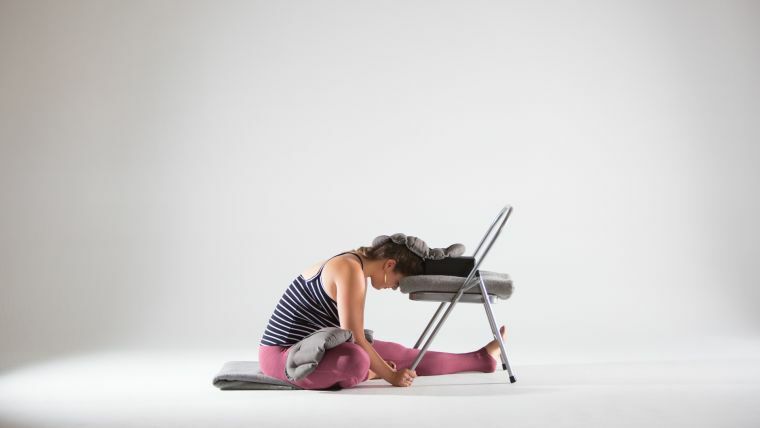 This setup can be a great relief for tension headaches. You Will Need: A bolster, one or two blankets, one or two sandbags, a helper. Place a bolster lengthwise on your mat. Sit on your heels facing the end of the bolster and place a blanket under your shins if you like. Separate your knees and draw the bolster between your knees until it touches your body. Fold at your hip crease and lower your torso to the bolster. Slip your forearms and hands under the bolster, palms up; there will be a little weight on your forearms. The bolster should be high enough so that your upper arm bones are vertical and your shoulders are relaxed; don’t prop yourself up on your elbows, and don’t let your shoulders scrunch up around your ears: Keep your neck long and free. If it’s comfortable, rest your forehead on the bolster (you may need to add a blanket or block so as not to squish your nose); otherwise, turn your head to one side. You want your spine to be in one line from your tailbone to the base of your skull. If your thoracic spine (middle to upper back) is rounding more than the rest of your spine, adjust the height of your props by adding or subtracting blankets along the length of the bolster. Using a stack of blankets rather than a bolster may help you to customize your support. Once you have found the ideal height for your props, have your helper place a sandbag across your sacrum, spanning the sacroiliac (SI) joints, which are located just above the sacrum itself. Allow the weight of the sandbag to direct your attention to the subtle movement of the breath in the back of your pelvis. Feel the deep fold in your hips. After five to fifteen minutes, have your helper place another sandbag lengthwise between your shoulder blades along the thoracic spine. Imagine its weight opening the vertebrae behind your heart and helping to extend your spine through the top of your head. You Will Need: A bolster, a block, one or two blankets, two or three sandbags, two to three washcloths or small towels, a helper. You are the best judge of how much height you need to be comfortable in supta virasana. I recommend using a bolster or blankets, and possibly some knee support, to make this pose truly easeful. To ease tight quads, you can first elevate the head end of the bolster by placing a block under it. Place a folded blanket across the top of the bolster to support your head and neck. Place a block horizontally in front of the bolster on its lowest setting. Sit on that block in virasana and lean back. If you feel strain in your low back, add a folded blanket along the length of the bolster so that the head-support blanket is on top of it. You also might enjoy placing a folded blanket or small cloth, like a washcloth, behind your knees to create space in your knee creases. Allow your arms to rest at your sides slightly away from your body; use blankets, eye pillows, or towels to elevate your wrists slightly, which will help ground your arm bones into your shoulder sockets. Your knees and inner thighs should be together, feet resting outside your hips. Ask your helper to place a sandbag across both thighs, about halfway between hips and knees, but high enough so that it encourages your thighbones to settle into your hip sockets. (If the sandbag is too close to the knees, the thighbones will lift.) Notice how the weight encourages your spine to extend and helps to deepen your breath. Now your helper can add sandbags across your forearms, midway between wrists and elbows. Feel their weight releasing tension from your arms. You Will Need: A bolster, a blanket, three sandbags, a helper. Place the bolster lengthwise on your mat. Place a single-folded blanket on the floor above the far end of the bolster. Lie back on the bolster so that the far edge of the bolster just touches the tips of your shoulder blades; use that leverage to lift your chest as you bring the tops of your shoulders to the blanket. Position your head on the blanket so that your forehead is slightly higher than your chin—your chin should not be tucked, but the back of your neck should be long. Rest your arms alongside you, palms up (like you would for savasana), or open your arms out into “goalpost” position with your upper arms perpendicular to your shoulders; relax your forearms and your hands. If this is comfortable for your low back, extend your legs; rest your heels on a block if you like. If extending your legs is not comfortable, keep your knees bent and your feet on the floor. Now your helper can place a sandbag on your feet for grounding. If your legs are extended, your helper can place the sandbag across your thighs, midway between hips and knees. The weight of the sandbag across the thighs helps to anchor the legs while encouraging the tailbone to lengthen toward your heels and protecting the lower back from overarching. Now, have your helper place sandbags on either shoulder. One end of the sandbag should be just over your collarbone, the other end on the floor. (Support the lower end with blocks if the bags tend to slip off.) The weight of the sandbags should gently draw the skin over your collarbones and the tops of your shoulders toward the floor, releasing the shoulders even more deeply. Stay five to fifteen minutes but no more than thirty. People with very stiff thoracic spines should be conservative—start with two or three minutes and consider using one or two stacked blankets instead of a bolster. You Will Need: A sandbag, a blanket, a helper. Lie on your belly. Support your forehead with your folded arms or with a rolled blanket. Turn your heels out and toes in to widen the sacrum, or turn your heels in and toes out if that feels more natural. Relax your torso and focus on the movement of your diaphragm as you breathe. As you inhale, feel the front body expand into the floor and the back and side ribs expand to the sides. Take several breaths. Now have your helper place a sandbag across your lower back from just below your ribs to just above your sacrum. Use this weight to refine your awareness of the vertical and sideways actions of your rib cage as you breathe. 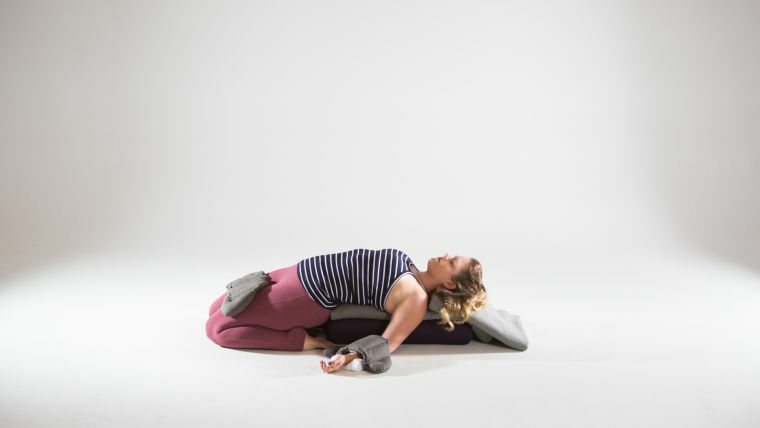 Expand your awareness into your back body so that you are “breathing into the sandbag.” Feel how the sandbag rises on the inhalation and sinks on the exhalation, along with the movement of your diaphragm, lungs, and ribs. Here, the weight not only helps refine your awareness but also strengthens your diaphragm. Don’t keep the sandbag on longer than about ten minutes; once it is removed, remain in the pose for several more breaths and notice how free and easy your breath feels. You Will Need: Two or more sandbags, a helper. Lie on your back, knees bent, feet on the floor. Open your arms into a T at shoulder height, palms up. Exhaling, engage your core to bring both knees into your chest. Feel your back on the floor. On your next exhale, swing both knees to the right and rest them on the floor so there’s about a 90-degree angle at your hips. Allow your back to lift slightly away from the floor. If it is comfortable for your neck, turn your head to look over your left shoulder. If not, keep your head centered. Pay attention to your breath. Have your helper place a sandbag on your upper outer thigh to encourage the turning of that top hip down toward the floor; the weight will also help reduce the work of the inner thighs. 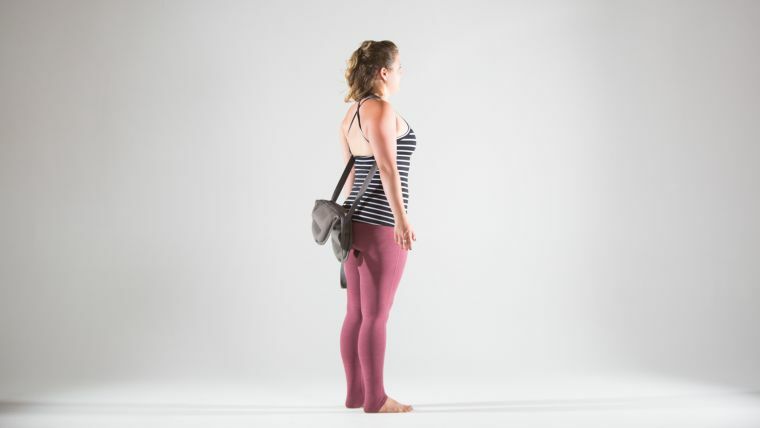 Then have your helper place a sandbag on your shoulder (just as in bridge pose, with one end of the sandbag just over your collarbone, the other end resting on the floor) to help ground the shoulder as you reach out through the left arm. If you’re feeling creative, you can experiment with placing a couple of sandbags lengthwise along both arms and enjoy the sensation of spreading your wings as the shoulder blades widen away from the spine. Again, observe your breath. Stay here for at least five to ten slow breaths. If you are comfortable, you can stay for five to fifteen minutes. Have your helper remove the sandbags slowly, beginning with the ones covering your arms. Remove the thigh bag last. Return to your starting position. Stay there for a few breaths before switching sides. To repeat the process, replace all of the sandbags (in the same order you originally placed them). Again, when you remove them, start with the thigh bag, then remove the shoulder bag or arm bags. Notice how adding and subtracting weight affects your breathing. You Will Need: Two sandbags, a blanket, a block, a helper. Most of the poses so far have been on the restorative side of the spectrum: supported, reclining, and practiced with long holds. In my mind, though, the queen of all restorative poses is viparita karani. Viparita karani is sometimes used therapeutically to normalize high blood pressure; it promotes a long, complete, relaxing exhalation, and it is also used to help prevent varicose veins in the legs. Viparita karani is simple to perform and to hold; it is, in short, the gold standard of restorative poses. Add sandbags, and you’ll never want to move. Sit with one shoulder against a wall. Then bend your knees and lie down on your other side so your sitting bones touch the wall. On your next exhale, walk your feet up the wall as you roll onto your back. Now straighten the legs so they’re parallel to the wall.Your arms can rest alongside you, overhead, or you can open them into a T, whichever is more comfortable. Now have your helper slide a folded blanket under your head and place one sandbag on the soles of your feet and the block on the floor at the crown of your head. Then have your helper place another sandbag so that the one end rests on the block and the rest covers the top of your head and forehead as far as the eyebrows—not your eyes. You actually can do this one without a helper: Get your legs up the wall once and note where the top of your head is. Come down. Place a block and a sandbag on the floor near where the top of your head will be, and a second sandbag next to where your hips will be once your legs are up. Position the blanket where your head will rest. Then bring your legs back up the wall. Bend your knees, grab the sandbag by your hips, and balance it on the soles of your feet. Slide your heels up the wall until your legs are straight. Feel the friendly weight of the sandbag snuggling the heads of your femur bones into your hip sockets and stabilizing your legs. Reach back and place the narrow edge of the block at the top of your head. Slide the sandbag onto your forehead as described above. Stay for five to fifteen minutes. Following the guidelines we’ve established, try experimenting with sandbags in other poses: staff pose (dandasana), revolved head to knee pose (revolved janu sirsasana), bound angle pose (baddha konasana), and hero pose (virasana) are all great choices. Author's note: Thank you to Cherie Cooper for modeling for the sample images that were used to create this article. 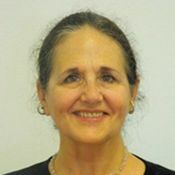 Pranams to Judith Hanson Lasater for her teaching, her creativity, and all her support. This piece would not have been possible without her, but any errors are mine. Editor's note: The sandbags used in this article, which double as breath pillows, were made by Fi Mitchell. You can purchase them here.